- It is known that many ACBA members are no longer attending meetings, at least on a regular basis. Also, quite a few of you have lost bees, and as such, are either out of the bee business or trying to become better prepared before getting the next batch of bees. - Whether you're interested in remaining on the ACBA mailing list for 2019 or NOT, please send an e-mail to Helen Baldwin to inform her as soon as possible so the necessary adjustments can be made. - Emails pertain to meeting reminders, information sharing and ACBA/NCSBA announcements. * First, make sure hive equipment is secured to resist strong winds. A simple brick on the top lid is likely to be insufficient to keep the lid from flying off in winds above 50 mph. A lidless hive can cause problems for the bees by introducing moisture and letting heat escape. Strapping the lid down with ratchet straps or securing with duct tape might be in order, particularly for outlying yards. The same is true for hive boxes, particularly if they are relatively new (i.e., the bees have not yet propolized them together sufficiently). Also consider removing unnecessary boxes (e.g., top-hive feeders) to minimize the wind profile. * Second, be sure to have the hives on sturdy stands or level ground. Entire beehives can be blown over by strong winds, particularly when they are fairly tall with many honey supers or are otherwise top heavy. If the hives are on tall or insecure stands, you can move them onto (dry) level ground temporarily to lessen the chances that they topple. Importantly, if you’re using solid bottom boards, be sure to have your hives tilting forward so that rain water does not pool and collect on the floor of the hive. * Third, beware of falling trees and tree limbs. These can be particularly problematic for beehives since they can completely crush all equipment and kill the entire colony. It is also hard to prevent with some sort of barrier or cover because of the sheer weight of many trees, so if you apiary is in a wooded location you may need to move the hives temporarily. * Fourth, make sure the hives are not in low-lying areas or those prone to flooding. River banks can be useful apiary locations because of their proximity to fresh water, but in flooding conditions entire apiaries can be tragically swept away. Be sure to move any beehives in flood plains until the waters have subsided. Beehives on the ground but in recessed areas can cause water to flood the entrances and may even suffocate the bees if not given an upper entrance. * Finally, following heavy rains like hurricanes, various local and state agencies have traditionally sprayed regions with stagnant water to control mosquito outbreaks. While important for public health, such insecticides can be extremely problematic for honey bees. If you are registered through the NCDA&CS, you will be contacted directly if your beehives are in an area schedule to be sprayed. If you are not registered, however, the state has no means to notify you and your bees may be at risk to insecticide exposure. Please consult the Agricultural Chemical manual for information and advice about how to mitigate exposure to pesticides. * The regular meeting of the ACBA was held on August 9, 2018. The meeting outline, below, is avalable as a downloadable file. * Jim Rash (shown right), one of our members, discussed winterizing. Before the meeting at 7:00, pizza and delicious snacks courtesy of Maggie McClelland were enjoyed by all! The How-To Festival will be held at the Ashe County Library on Saturday (July 14) from 11-3. ACBA will have a table under a tree; we had fun last year and are eager to share bee info again with some very thoughtful kids (and adults)! If you can help the entire time or even a part of the time, please let Helen Baldwin know - any and all help will be greatly appreciated! We could probably use another folding table if anyone who comes happens to have one. * The regular meeting of the Ashe County Beekeeping Association was held on April 12, 2018 at the Agriculture Extension Office in Jefferson, NC. * Jim Miles was the speaker who talked about hive splitting. * Click here to view the meeting minutes. * The 'hive open house' scheduled for this Saturday at Maggie McClelland’s house will not be held due to inclement weather! * Stay tuned for information on a date and time if it will be rescheduled. * Everyone's important topic for the start of a new year of beekeeping!! * In the case of the Hidden Happiness Bee Farm (H.S. Greene), their nuc delivery is scheduled for the third week in April. The cost/nuc is $160.50. For more info, contact H.S. Greene at 336-957-0275 or by e-mail at moldings56@yahoo.com. - Enter information to be added to our waiting list. - We expect to have nucs available for pick up between April 16 and May 14 from our farm in Creston, NC or a mutually agreeable location. - Exact dates and times to be determined. - Cost is $175 per nuc and will be in an EZ Nuc box. - No guarantee of availability, but we will communicate as soon as possible as things progress. Contact Sullivan Wilkes, sulli.wilkes@gmail.com or 828-434-0066 with questions. * The minutes of the ACBA Meeting on March 8, 2018 are posted here. * The final, regular business meeting of the Ashe County Beekeepers Association was held on October 14, 2017 at which time Greg Fariss, NC State Beekeeper for counties including Ashe, spoke on winter hive preparations...thanks, Greg. Before his remarks, Julia Houck, County Executive Director of the USDA Farm Service Agency briefly described a program for small farmers, including beekeepers to receive funding for losses due to various circumstances. Open the meeting minutes here. - Jeff Taylor was the recipient of the raffle for the anniversary mini-hive made by H.S. Greene...it was mini-hive # 7 and represents the seven years that the ACBA has been in existence. * The ACBA November meeting will be the final meeting in 2017. Click here for information. * With uncertain track of hurricane Irma, there are some important considerations for beekeepers who may be affected by the heavy rain and winds. Please further disseminate to your local network of beekeepers. - First, make sure hive equipment is secured to resist strong winds. A simple brick on the top lid is likely to be insufficient to keep the lid from flying off in winds above 50 mph. A lidless hive can cause problems for the bees by introducing moisture and letting heat escape. Strapping the lid down with ratchet straps or securing with duct tape might be in order, particularly for outlying yards. The same is true for hive boxes, particularly if they are relatively new (i.e., the bees have not yet propolized them together sufficiently). Also consider removing unnecessary boxes (e.g., top-hive feeders) to minimize the wind profile. - Second, be sure to have the hives on sturdy stands or level ground. Entire beehives can be blown over by strong winds, particularly when they are fairly tall with many honey supers or are otherwise top heavy. If the hives are on tall or insecure stands, you can move them onto (dry) level ground temporarily to lessen the chances that they topple. Importantly, if you’re using solid bottom boards, be sure to have your hives tilting forward so that rain water does not pool and collect on the floor of the hive. - Third, beware of falling trees and tree limbs. These can be particularly problematic for beehives since they can completely crush all equipment and kill the entire colony. It is also hard to prevent with some sort of barrier or cover because of the sheer weight of many trees, so if you apiary is in a wooded location you may need to move the hives temporarily. - Fourth, make sure the hives are not in low-lying areas or those prone to flooding. River banks can be useful apiary locations because of their proximity to fresh water, but in flooding conditions entire apiaries can be tragically swept away. Be sure to move any beehives in flood plains until the waters have subsided. Beehives on the ground but in recessed areas can cause water to flood the entrances and may even suffocate the bees if not given an upper entrance. - Finally, following heavy rains like hurricanes, various local and state agencies have traditionally sprayed regions with stagnant water to control mosquito outbreaks. While important for public health, such insecticides can be extremely problematic for honey bees. If you are registered through the NCDA&CS, you will be contacted directly if your beehives are in an area schedule to be sprayed. If you are not registered, however, the state has no means to notify you and your bees may be at risk to insecticide exposure. Please consult the Agricultural Chemical manual for information and advice about how to mitigate exposure to pesticides. * The August ACBA meeting was held on August 10, 2017 at which time Doug Galloway, Master Beekeeper (pictured right) presented information on treatments for hive health. * The regular meeting was attended by 20 ACBA members. Recorded minutes from the meeting are here. - H.S. Greene modeling a respirator for use when treating hives using oxalic acid as a fumigant. - Three photos of the Varroa easyCheck by Veto-pharma which is a simple alcohol wash for use when determining mite loads in a hive. * After the program concluded, several door prizes were awarded to attendees. * The June ACBA meeting was held on June 8, 2017 at which time Greg Fariss, State Apiary Inspector for this area who presented information on Pests & Diseases. Greg is pictured (on the left in the top photo with Randy Baldwin, right). * The regular meeting was attended by 18 ACBA members. Recorded minutes from the meeting will be posted soon. * The May ACBA meeting was held on May 11, 2017 at which time Bob Cole, certified Master Beekeeper by the Eastern Apicultural Society of North America, presented a program on bee swarms that included a riveting, hour long video which had many vignettes displaying the capture of swarms from various locations. - Doug Hayes won a copy of "First Lessons in Beekeeping" (the book most commonly used for bee classes) donated by Bob Cole. - Jeff Taylor won a set of pliers from Hidden Happiness Bee Farm. - George Katsoudas and Doug Hart both won a pint of Harry Bee Healthy donated by past president Harry Galer. - Jim DeJuneas won the Nuc from Hidden Happiness Bee Farm. Congratulations! * Thanks to everyone who participated by buying raffle tickets and supporting the ACBA. * The Honey Cookbooks being sold by NCSBA will be picked up on July 14, the day after our July meeting. If you ordered a book or two ($20 each), you may pay for it at any of the next three meetings (May, June, July). Your book(s) will be delivered to the August meeting, although you can make arrangements with Helen or Randy before then. * NC Chapter members who also hold NCSBA membership are being asked to help mark the NCSBA’s centennial with the purchase of an outstanding cooking-with-honey cookbook that has been completed by the cookbook team of Sandy Carlson, Lynn Lucas, Mary Jaynes, Teresa Green and S. Anne Fifer. * This cookbook would make a wonderful addition to your cooking library or as a birthday, anniversary or Christmas gift. All profits will be donated to the NC Agricultural Foundation and will directly benefit the Apiculture program at NCSU. * Support is needed to help make this project a success. Please consider purchasing or pre-ordering copy(s) for later sale of gifting so as to help greatly with our start-up costs. * Price is $20 per copy and the deadline for pre-order commitment is April 30, 2017...money will be collected upon delivery. * Please send your pre-order commitment to Sandy Carlson at sccarlson@msn.com or contact her via phone at 919-853-9060. * ALL 300 recipes in the cookbook have honey as an ingredient, Many of the recipes have received awards and/or are winning recipes of the NCSBA Summer Conferences. - Start your meal with a Honey Mango Margarita served with an Orange Honey Glazed Salmon and Spinach Salad with Honey Dressing & Honeyed Pecans topped off with Honey Fudge Pie. - Honey Sweetened Lemonade served with Honey Glazed BBQ Pork and an Apple Baked Bean Casserole topped off with Honey Cream Apple Pie. - For those in-between hunger pains, have a Cinnamon Pecan Granola Bar. Please forward this message to family and friends who enjoy honey or cooking, and thank you for your support. 1. Our April meeting Thursday will feature B Townes, president of Beekeepers of Wilkes County, who will talk about foraging. With our crazy winter and spring weather, we're particularly eager to hear what B has to say. The meeting starts at 7pm at the Extension Office behind Bojangles in Jefferson; B will be speaking first, so come early and grab some delicious snacks, too! Visitors are welcomed! 2. Bill Naser, our treasurer, will be on hand to take dues before the meeting and during break. ACBA (local) dues - $10/individual or $15/family. NCSBA (state) dues - $15/individual. 3. Tickets for the nuc will be sold thru the break at the meeting Thursday, and the drawing will be held at the conclusion of the meeting. Tickets for the nuc, valued at $140+, are $5 each, or 3/$10. If you took tickets to sell, please be sure to bring them and the tickets to the meeting! If you can't attend Thursday, let me know, and arrangements will be made to get them. 4. Door prizes this time: Wiss Utility Shears (courtesy of Hidden Happiness Bee Farm), cap (courtesy of Hive Tracks), comfrey plants, and pollen patties. 5. Pollen patties will also be on sale at the meeting: $3/patty, or 4/$10. All proceeds will go to ACBA. 6. Orders for NCSBA’s Honey Cookbook need to be turned in April 30. The cost for the book, which includes 300 recipes using honey, is $20. All profits will be donated to the NC Agricultural Foundation and will directly benefit the Apiculture program at NCSU. 7. Linda Katsoudas and I had fun representing ACBA at the Ashe County Library’s Seed Library kick-off on Friday! We talked to several folks very interested in bees, including a library staff member who is now a beekeeper. Big thanks to Marna Napoleon, beekeeper/new ACBA member/library staff member for inviting ACBA and to Linda for agreeing to help! 8. On Saturday, April 22, ACBA will be at the Ashe Farmers Market from 8am-1pm for Earth Day. Several members have volunteered to help, but we’re always game for more helpers! If you’d like to help for even a little while, please let me know. We always have fun! I don’t have any other information yet but will pass it on as soon as I get it. 9. Also on the 22nd (12-1pm) is a beekeeping meeting with Greg Fariss, state apiary inspector, at Southern States in Jefferson. Lunch is provided at no charge. Reservations need to be made by the 19th to the Extension Office (336-946-5850 in order for them to be prepared with ample materials, seating, and lunches. * The first meeting of the year is March 9th and will begin at 7:00 at the Extension Office. The focus of this meeting will include a brief discussion by James Wilkes of a hive sampling program he was involved in last year, followed by President Randy's explanation of nucs and how to install them. * Maggie McClelland, our program chair, will provide delicious refreshments again, and raffle tickets for the nuc will be sold! The nuc tickets - $5 each or 3/$10 - will be sold at the April meeting as well, with the drawing taking place at the conclusion of the April meeting. * For those paying dues, Bill Naser, our treasurer, will be available around 6:15, if not a little earlier. If you can come early to pay your dues, please do, as Bill will need to leave for another meeting around 6:45. He should be able to return before the end of the ACBA meeting if you miss him. * If you'd like to purchase raffle tickets, you're also urged to come a little earlier than usual to get that taken care of. * If you're not sure if your 2017 dues have been paid, feel free to check with me by Wednesday afternoon (I'll be on unexpected grandmama duty and will miss the meeting... and Maggie's treats!). * We had a successful Introduction to Beekeeping class last month (see pictures, in the thumbnails to the right). All passed the class portion of the Certified Beekeeper test, and I'm pretty sure everyone ended up with a little more knowledge than they started with. We're fortunate to have some terrific new members of ACBA, too! * One of our new members, Tina Roberts, has some yellow blossom sweet clover packages to sell for very reasonable prices (1 lb - $4, 8 oz - $2, 4 oz - $1). Randy's talked to two beekeepers who both raved about their bees' love for yellow clover, so he's been dreaming up places to plant some ever since. If you're interested in learning more about the yellow clover, you can contact Tina at tina@oriannanaturals.com. * Also, Joy Lewis said that if anyone is interested in her 'Joy Be Sweet' (her version of Honey B Healthy), let her know - jsljjj@skybest.com. The bees love it! REMINDER: ORDER NUCS BY FEBRUARY 15TH! - Nucs are available this year thru Hidden Happiness Bee Farm in Deep Gap! Cost per nuc is $140 + tax. 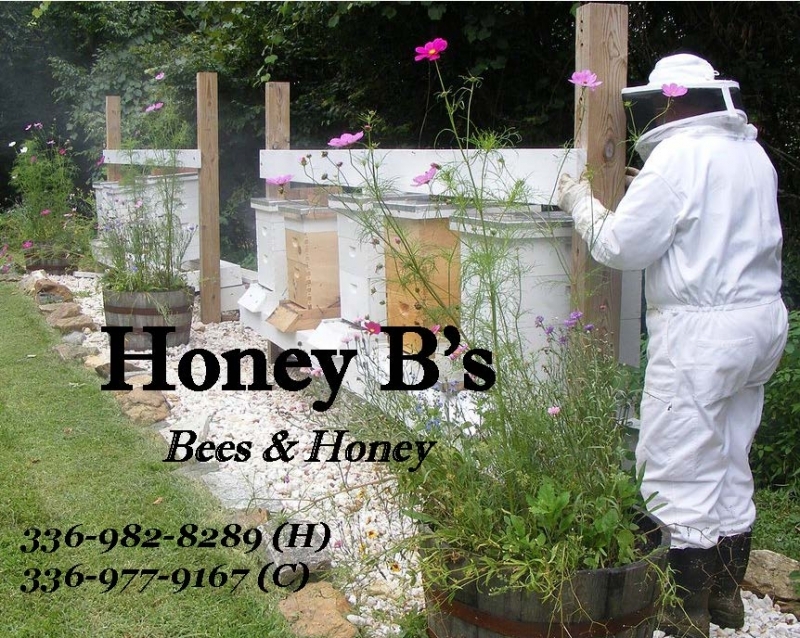 - Nucs purchased thru Hidden Happiness Bee Farm by current members of Ashe County Beekeepers Association will benefit ACBA, so be sure to mention that you’re a member of ACBA at the time you place the order. - For more info and/or to order, contact Hidden Happiness Bee Farm (moldings56@yahoo.com or 336-957-0275). - There is currently a planned delivery of nucs for mid-late April and another for mid-late May, so please be prepared to specify which delivery you’re interested in. * IMPORTANT NOTE: Orders must be placed no later than February 15 to assure availability. * Joey Bullin will sell nucs to Randy for $115; ACBA is excited to be offering nucs for sale in 2017. * Hope to sell raffle tickets for a nuc at March and April meeiting. A winner will be drawn at the end of April meeting. * Attendees of Intro to Beekeeping course will get a discount on nucs and woodenware. * Joey Bullin will make and sell grease patties for $2 each. * Pollen patties can be made by Maggie McClelland, Randy and Helen Baldwin and others? ACBA would sell to members and would pay for supplies to make them. NCSBA members should read the Winter issue of Bee Buzz and be sure to look up the article about our own Doug Galloway on page 21! He and Mary Williams, president of the Watauga bee group, are making a difference by going out into the community (including schools!) and teaching about bees! * The final ACBA meeting was our annual potluck dinner held on November 10. * Those in attendance brought loads of goodies: salad, dessert, drink, bread, veggie, etc. The club furnished the meat but also had other meat dishes! * A final appeal in 2016 to all Ashe County beekeepers to please consider volunteering! Because all of us have so many other things going on, we try to keep 'in person' meetings to a minimum after our initial meeting (January or February) to map out the year. We've been able to communicate with each other via email most of the time. It's a fun group, and we're excited about ideas for next year! * The October meeting of the ACBA for 2016 was on Thursday, October 13, 2016 at the Ashe County Cooperative Extension Office, Ashe County Center, 134 Government Circle, Jefferson, NC 28640. * Below are three downloadable files that provide general information on the ACBA's efforts to "Help the Bees!" as well as our association programs. * "What's Buzzin' in 2016" is a projected list of meeting dates and programs for the year. Click here to open the subject issue of the NC Bee Buzz. * If the link does not work, copy and paste the ENTIRE URL into your browser’s address bar. Please be patient as this file could take several minutes to download depending on your system. * The Bee Buzz has new editors and an entirely new look. We are excited about the changes and hope you are also. * The July meeting of the ACBA for 2016 was held on Thursday, July 14, 2016 at the Ashe County Cooperative Extension Office, Ashe County Center, 134 Government Circle, Jefferson, NC 28640. * Meetings begin @ 7:00 PM, but there is generally a Q&A session that is held from 6:30 - 7:00 PM if persons wish to have a discussion regarding anything to do with beekeeping as a hobby or for any matters that may be of interest. * Our guest speaker was Greg Fariss, regional Apiary Inspector for Ashe County. Greg has been a regular speaker for our ACBA monthly meetings and always provides a wealth of information about beekeeping. On July 14 Greg spoke on diseases of bees. There was also be an open Q&A session for member concerns, comments and questions to share! * The June meeting of the ACBA for 2016 was held on Thursday, June 9, 2016 at the Ashe County Cooperative Extension Office, Ashe County Center, 134 Government Circle, Jefferson, NC 28640. * The ACBA President, Randy Baldwin covered a variety of topics about hive management, including information on how to recognize and prevent chalk brood. See the attached photographs which show chalky debris that can appear on the landing board of a hive that is experiencing chalk brood - which is usually the result of too much moisture in a hive - and a box which Randy designed that contains wood shavings that can help reduce moisture. Link to the meeting minutes to see additional information discussed at the meeting. * The May meeting of the ACBA for 2016 was held on Thursday, May 12, 2016 at the Ashe County Cooperative Extension Office, Ashe County Center, 134 Government Circle, Jefferson, NC 28640. * To start the meeting, ACBA President shared some slides depicting EFB (European Foul Brood) vs. (American Foul Brood) disease in hives and actions to take when a hive is infected. * The main speaker for the evening was James Wilkes who shared information and slides on his travel and attendance at the international Apimondia meeting at the end of 2015 in Seoul, South Korea. He said the meeting was a fantastic experience and he'll be looking forward to the 2017 event in Istanbul, Turkey. * Check out our 2016 Slate of Officers. * March - discussion: Opening hives and what should I be feeding, plus a discussion on nuc installation...speakers will be James Wilkes and Randy Baldwin. * April - refresher on hive splitting...Jim Miles is the planned speaker. * May - James Wilkes will present information on his travel and attendance at the international Apimondia meeting at the end of 2015. * June - mid-year round table...participants TBD. * July - diseases...presenter Greg Fariss. * August - program TBD. * September - winter preparations. * October = Greg Fariss will again be our speaker and will cover a variety of topics on beekeeping. * November - plans are to combine the pot luck dinner with a voluntary bazaar. * The regular meeting of the ACBA was held on August 13, 2015 at the Ashe County Agriculture Center in Jefferson, NC to a packed audience of 28 Ashe County beekeepers and guests. * The evening program consisted of an exceptionally informative presentation by Greg Fariss, regional Apiary Inspector for Ashe County - as seen in the thumbnail picture to the right - covering a variety of topics including winter hive preparations, diseases and viruses associated with Varroa mites and treatment for Varroa mites. * As part of the presentation, Greg shared a handout dealing with sampling colonies for Varroa mites. * A promising new treatment option for controlling Varroa mites was also discussed and the product data sheet for Oxylic acid dihydrate was handed out. * The regular meeting of the ACBA was held on July 9, 2015 at the Ashe County Agriculture Center in Jefferson, NC. * The evening program consisted of a panel discussion by ACBA President Randy Baldwin, Program Manager Joy Lewis and guest James Wilkes, owner of Faith Mountain Farms and developer of Hive Tracks. * The regular meeting of the ACBA was held on June 11, 2015 at the Ashe County Agriculture Center in Jefferson, NC. * The evening program featured several YouTube videos dealing with hive swarming that were presented by Program Director, Joy Lewis. * Minutes of the meeting can be read here: 6/11/15 Meeting Minutes. * The regular meeting of the Ashe County Beekeepers Association held on April 9, 2015 was treated to an extremely educational session by Doug Vinson, Regional Director of the Mountain Region, NCSBA. * Doug's presentation "Summer splits: timing and techniques for mite load reduction, colony manipulations to interrupt Varroa mites" can be read here: Regular Meeting Minutes, 5/14/15. * The evening meeting lasted well past 8:30 PM and didn't allow for any Q&A discussion by the 10 members and guests in attendance. * Thank you Doug for a great meeting! * The regular meeting of the Ashe County Beekeepers Association held on April 9, 2015 was treated to an extremely educational session by Jim Miles on two topics: swarming and splitting of hives. * The evening included a lively Q&A discussion by the 26 members and guests in attendance. * Thank you Jim for a great meeting! At the end of the meeting, a raffle was held for the members and guests present to select from a collection of four beekeeping books that were donated by Fowler Bush. Eugene Brown, NCSBA Freshman Mountain Regional Director and Program Chair of the Surry County Beekeepers (R), presents Randy Baldwin, ACBA President his certificate for completing all requirements to be recognized as a Journeyman Beekeeper. * Each of the regular 2015 ACBA meetings will be prefaced with a variety of short topics/information (to be announced). There will be some workshops, and hands on opportunities for new beekeeper's throughout the summer as well (to be announced). - March - Bee Aware team from Boone Bee Club. - April - Jim Miles, if available. Topic: Hive splitting and Q&A's from group. - May - Methods on how to catch swarms, fielding Q&A's from beekeepers in the meeting. - June - Panel and sharing differing likes of equipment used, possibly with some show and tell. - July - James Wilkes. Topic: diseases and treatments. - August - Joy Lewis. Topic: use of Essential Oils. - September - Member show and tell: Readying hives / winter preparations. - October - Beekeeping Bazaar. - November - Elections and Association pot luck meal together. * The 2014-2015 Colony Loss and National Management Survey is being conducted now; beekeepers are encouraged to visit the site and enter your data. * This survey is important to help determine the status and health of bees in our world. * The last regular meeting of the ACBA in 2014 was held on November 13, 2014. Like last year, the final gathering of members and guests featured a wonderful pot-luck meal with dishes provided by the association, as well shared sides and desserts brought by members. * Out-going President Harry Galer (right) welcomed everyone to the evening and shared information about the slate of officers to be voted on at the end of the evening's activities. * Several items - hats, shirts and a 1-year subscription to Hive Tracks (Pro) donated by James Wilkes - were also raffled to members present. Open the thumbnail photographs to the right to see a few of the wonderful desserts that were on display, and later eaten! Show your love of beekeeping- don't leave home without one! ACBA member George Katsoudas shows off one of the Ashe County Beekeepers Association's new hats with its beautifully embroidered association logo...only $18.00. get one while supplies last. ACBA has several tables displaying information and products about the wonderful world of beekeeping at the Museum of Ashe County History's Autumn Leaf Festival. Come on out and help support our association. * The regular meeting of the ACBA held on October 9, 2014 featured a panel of ACBA members - Randy Baldwin, Joy Lewis and James Wilkes - sharing their experiences and information about preparing hives for overwintering. * Click the below link to read the minutes from the meeting which contains their remarks. Ashe County beekeepers are cautioned that the varroa mite infestation has started and everyone needsto be vigilant taking mite counts to see what kind of IPM is needed....and be deciding when to do it. Word from off the mountain form an experienced beekeeper is that they were plowing through many hives!!! Open the below link for some comments related to the current situation where there is a dearth of food sources for bees in Ashe County. * Ashe County Beekeepers Association members who use Chrome as their default web browser may be frustrated when the RSS link on the News and Events page doesn't yield the intended results. * Click on the below link for a "fix" which our web host, Ric Kolseth has recommended to enable you to fully utilize the RSS link.